Ralph Lauren isn’t just about plain polo shirts and peacoats anymore. It’s about the hype. Looking for some buzz, the 52-year-old fashion house using tactics straight from the “hypebeast” playbook—industry slang for shoppers who obsess about clothes that get extensive publicity. Similar to Apple fanatics who camp out in advance of a new iPhone release, these devoted buyers are willing to stand in line for hours to get their hands on the latest drop of sneakers or T-shirts from brands such as Supreme or A Bathing Ape. “We’re in the brand-building business,” Ralph Lauren Chief Executive Officer Patrice Louvet said in an interview Tuesday. That comes at a cost. The company increased its marketing investment 18 per cent in fiscal 2019 compared to the year prior. Louvet plans to increase that budget to 5 per cent of total sales—which would be more than US$300 million—to court younger buyers. “We do want to make sure we have competitive marketing support” in order to lure new shoppers to the brand, he said. That cash will be spent largely on social and digital as the brand moves away from traditional print ads. The company has brought on a new cohort of younger celebrities to sell its goods, such as Taylor Hill, the face of its Romance fragrance. The 22-year-old supermodel walks in the world’s biggest fashion shows and has 12.3 million followers on Instagram. A holiday gift campaign included social-media savvy stars Rachel Zoe, Cameron Dallas and Olivia Palermo. So far, the boosted marketing budget has been a successful piece of Ralph Lauren’s revitalization plan, along with a cutback on discounts and inventory. Last quarter, it reversed a streak of same-store sales declines going back to 2015. On Tuesday, the company reported rosy earnings that exceeded analysts’ estimates and said its marketing during the crucial holiday season paid off, sending shares up the most in eight months. In recent years, Europe’s luxury houses have concluded that streetwear cannot be ignored if they’re to win over millennials and Gen-Z. Last May, Louis Vuitton hired Virgil Abloh, the designer behind the Off-White streetwear label, to lead men’s design. That same month, Supreme had its high-fashion moment at a US$1 million auction in Paris. Yet few of America’s oldest fashion brands have fully embraced the skater-friendly clothes that have become a cultural phenomenon. Ralph Lauren, however, is starting to learn the playbook. When the brand released its Winter Stadium collection last fall, it partnered with streetwear mainstays Opening Ceremony and e-commerce site HBX. In November, Ralph Lauren released a collaboration with British streetwear label Palace. Rather than sell the items in limited quantities across all its stores, the clothes were sold in a few select Ralph Lauren locations and specialty boutiques such as Dover Street Market, a Commes des Garcons store in South Korea and online through the Polo app. The strategy is right out of the classic sneaker drop playbook: Create scarcity and borrow the credibility of a partner label. Upon release, the Ralph Lauren website struggled to keep up with demand and Palace items are now selling for much more than their retail prices on the secondary market, as limited-edition goods often do. A Palace x Ralph Lauren sweater with a preppy bear on a skateboard that retailed for US$475 is going for about US$800 on popular streetwear reselling site StockX. 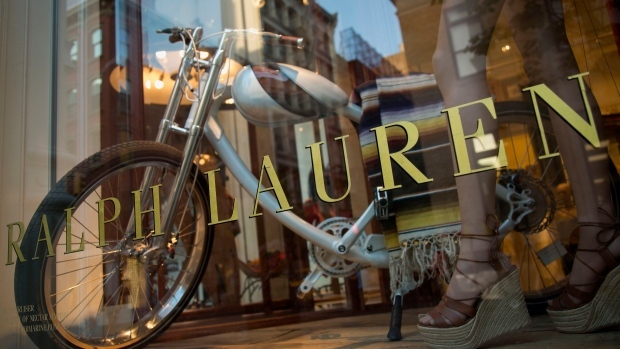 Seventy-five percent of shoppers who bought items from the collaboration were new customers, Louvet said. Those buyers were about 10 years younger on average than the usual Ralph Lauren shopper, according to company data. The label must be careful not to overdo these splashy collections, Louvet said. Otherwise, the hype train might run out of steam.